The quote above and the following excerpt are from Buckminster Fuller's essay on his vision for the Center's design and it's connection to the 90th meridian. He wrote this piece to commemorate the official opening of the Center. It is titled Geoview and it is more of a prose poem than an essay, revealing Fuller's roots as an American Transcendentalist. Bucky commented that reading the works of his Aunt Margaret Fuller had a large influence on his life. Margaret Fuller was the first editor of the transcendentalist journal, The Dial, and she is widely viewed as the matriarch of the transcendentalist movement inspiring people like Ralph Waldo Emerson and Henry David Thoreau. Bucky's belief in the spiritual principle at the heart of material nature is made evident in his writing. Lying in the outskirts of St. Louis, Missouri, USA, the Edwardsville Center for Spirituality and Sustainability of Southern Illinois University stands with surveyor-certified mathematical exactitude symmetrically astride the true planet Earth’s “90th” western meridian of longitude. 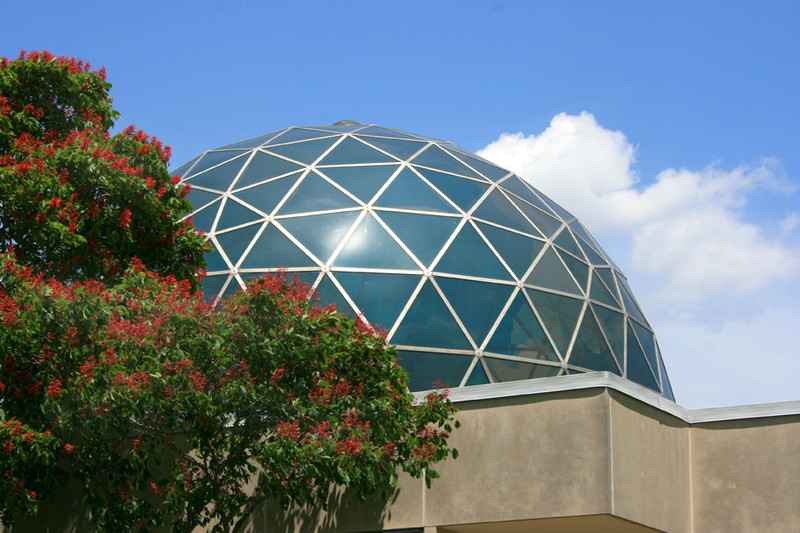 The 40-foot diameter three-quarter sphere dome of the Center is a transparent miniature earth. Our planet’s continents can be seen accurately outlined against the transparent blue oceans as they would be seen by X-rays if one descended by elevator from Edwardsville to the center of the real earth, always keeping Edwardsville directly overhead. The continental shapes appear reversed, but soon become as easy to read as mirrored images. The miniature Earth dome’s “90th” meridian West and the real Earth’s “90th” meridian West and their respective North-South polar axes, as well as Lhasa, Tibet, Bangladesh and Calcutta on the real Earth’s “90th” meridian East, all lie in exactly the same geometrical plane, which vertically cleaves the Edwardsville miniature Earth and real Earth spheres. All the polar great circles East-West meridian degree completions add to 180, e.g., “80” West continues beyond the poles as “100” East. Only the “90” West continues as “90“ East and can be referred to combined as “90th.” The “90th” runs through the demographic center not only of North America’s 9% of humanity, but also through the integrated demographic center of Russia and the Orient’s 60% of humanity. Look north along the “90th” to two-thirds of all humanity. Look north and south along “90th” to all humanity existing less than five jet hours distance away from the “90th.” The “90th” is our planet’s great circle main street. As an architectural structure, an embodiment of the world, and a place of worship, the Center for Spirituality and Sustainability stands as a one-of-a-kind testament to R. Buckminster Fuller’s legacy and sheds interesting light on his genius and his attitude toward life. As an architect, engineer, inventor (28 patents), philosopher, author (29 books), geometrician, cartographer, teacher, poet (Charles Eliot Norton Chair – Harvard), world visionary (coined the term “spaceship earth”) and futurist, Fuller is recognized as one of the preeminent mental giants of the 20th century, truly “the most influential futurist in the history of the world.” (Encyclopedia of the Future, 1996) The most important element of the building is the geodesic dome. It is the focal point of the Center. It was Fuller who conceptualized and popularized the dome structure and gave it the name “geodesic.” Today there are estimated to be thousands of geodesic domes around the world serving diverse purposes. 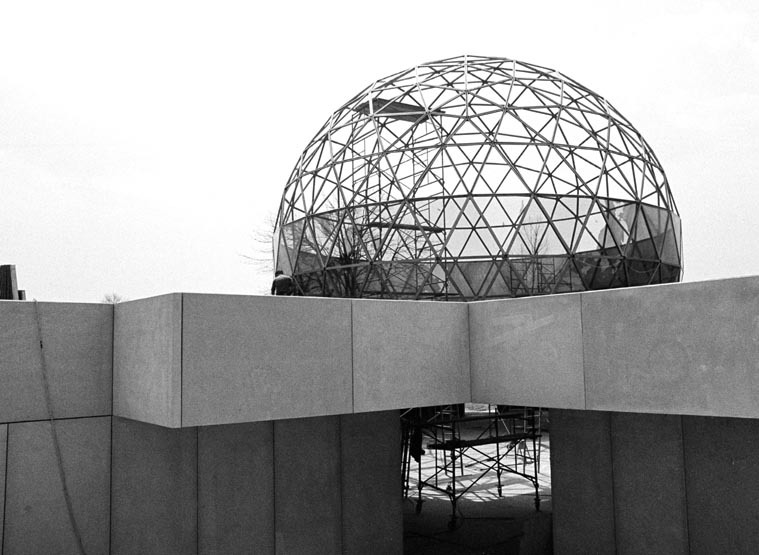 Two earlier domes received international recognition - the U. S. Pavilion at Expo 67 in Montreal Canada (skeletal aluminum structure minus acrylic skin still stands and is presently site of Biosphere, an environmental museum) and Union Tank Car Company, built in 1958 in Baton Rouge, Louisiana (largest clear-span structure of its time, since demolished). 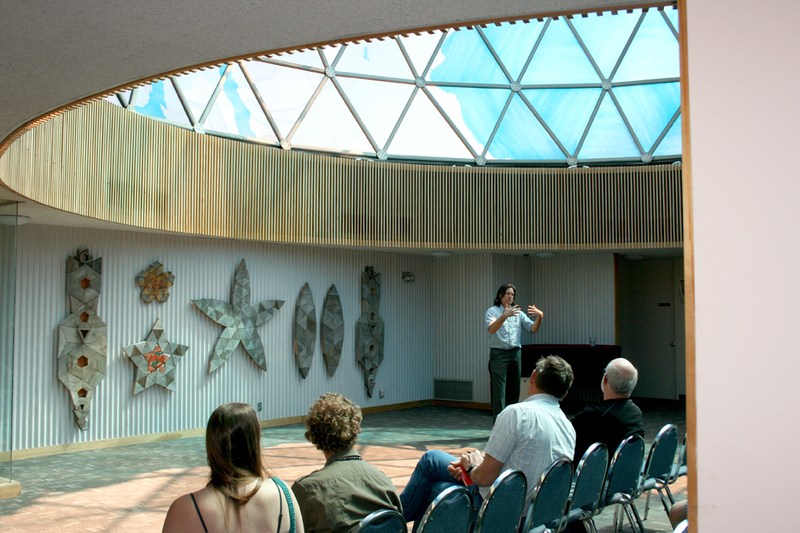 The Center for Spirituality and Sustainability dome, however, is one of only two that were personally conceived, designed, and built by Fuller, in conjunction with his architect partner Shoji Sadao, the Expo 67 dome being the other. Planning for the creation of the Southern Illinois University Edwardsville campus began in the 1950’s with local religious leaders meeting in 1960 at the suggestion of SIU President Delyte Morris to begin discussions for a campus ministry. The University Religious Council was formed by several denominations from the local faith community to begin planning for a single facility on the campus to be used as a place of worship. The architectural firm of Fuller and Sadao, Incorporated, of Cambridge, Massachusetts, built the Religious Center Dome on the campus of Southern Illinois University Edwardsville in 1971 at the request of the University Religious Council. Designer Buckminster Fuller and Architect Shoji Sadao sited the center’s miniature-Earth geodesic dome on the University’s campus to straddle the Earth’s 90th Meridian in reference to their earlier work on a design for a more accurate two-dimensional world map called the Dymaxion Map. Just like the SIUE Religious Center Dome, Fuller and Sadao’s Dymaxion Map also uses the 90th Meridian as its central line of reference similar to the way that conventional world maps use the equator. The invention of the Dymaxion Map won Buckminster Fuller a patent in cartography in 1946. Fuller and Sadao worked together to redraw Fuller’s Dymaxion Map into an icosahedron-based version in 1954. Fuller’s Dymaxion Map is innovative for its ability to convert the land and ocean features of the spherical Earth into a two-dimensional map with minimal distortion by converting the Earth’s surface into a series of triangles in much the same way he later used his geodesic dome invention to convert a sphere into a structural lattice of triangles. Following his patent for the Dymaxion Map, Fuller received U.S. patent 2,682,235 on June 29th, 1954 for the his Geodesic Dome. As an inventor Fuller holds a total of 28 patents. With the inclusion of the Earth’s continental landmasses and oceans in its design, this geodesic dome is unique, even among Fuller domes. When you stand beneath it and look up through its triangular panes, you see the continents of the planet arrayed before you with no lines of demarcation to denote national boundaries or interests. Three quarters of the earth’s landmass is depicted on the 40-foot dome. The land is clear, and the oceans, seas and lakes are tinted blue on the dome’s Plexiglas triangular panels. It is a surveyor-certified, mathematically exact, transparent miniature Earth. This dome is also a true planetarium. Any star seen from inside, at any location on the continents or oceans is at that moment exactly in zenith over those very geographical points on the Earth itself. The dome also features a ring of lights positioned on top of a ledge running around the interior perimeter of the circular dome room that illuminates the translucent miniature-Earth dome from with-in making it a luminous sculptural beacon. As an author of 29 books expressing his philosophy, Fuller capitalized on the construction of this dome to be the physical/architectural embodiment of his concepts regarding society, conservation and global unity that are informed by his reverence for “the law’s of nature and of nature’s God.” Fuller intended this dome to awaken in us a planetary sensitivity, a global consciousness. His ardent hope was that we would embrace our collective responsibility to one another as citizens of a world community. The construction of a building as an architectural expression of unity on a college campus in 1971 takes on particular historic significance considering the national and global social climate of the times. A historic epoch can be recognized in the United States as beginning in the mid-1960’s and concluding in the early 1970’s. This time period was one of the most volatile in recent U.S. history marked by the assassinations of John F Kennedy, Robert Kennedy and Martin Luther King with wide spread social unrest displayed in protests related to African-American civil rights, women’s rights, environmental protection and the U. S. military action in Vietnam. Senator John L. McClellan, Democrat of Arkansas, led an investigation and Senate hearing in 1970 finding that from January 1969 to April 1970, the United States sustained 4,330 bombings that resulted in 43 deaths and $21.8 million in property damage. On May 4th, 1970 4 unarmed students were shot and killed during protests on the campus of Kent State University over the U. S. expansion of the Vietnam War into Cambodia. In a reaction to the killings at Kent State protests erupted on campuses across the country. On May 7th 1970 on the campus of Southern Illinois University in Carbondale Illinois where Buckminster Fuller was a professor engaged in teaching and designing the Religious Center, protests began in response to the Kent State killings that lasted a week resulting in the Governor of Illinois calling in the National Guard and the city of Carbondale declaring a state of emergency. In the previous year on June 8th, 1969 war protests on the SIUC campus by students objecting to University’s development of a Vietnamese Study Center to study ways to “reconstruct Vietnam after the war” lead to the arson of that campus’ most iconic building, Old Main. Old Main also housed SIUC’s ROTC unit that was seen by the protesting students as an extension of the U. S. military industrial complex. It is within this very fractured and divided social climate that Buckminster Fuller designed his geodesic domed architectural expression of global unity for the SIUE campus. The Fuller dome on the earth’s 90th meridian is a unique architectural and historical artifact of the Fuller legacy. In its simple structure it epitomizes the essential elements of Fuller’s life and work: developer of the geodesic dome, planetary visionary, world citizen, and intellectual giant of the twentieth century, who saw in the design of the universe a wisdom of God, and to whose wisdom he completely dedicated his life to be used only to the advantage of all humanity.